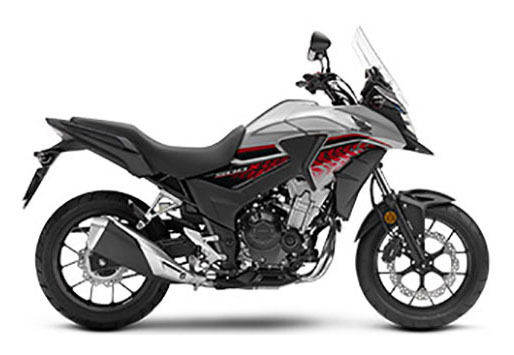 Whether it’s a canyon road or a painstaking commute, the CB500X handles it all. It’s equipped with a torquey 471 cc parallel-twin DOHC engine that transforms point A to Point B into an unforgettable adventure. It also sports an upright handlebar, an adjustable, compact windscreen for longer rides, and a large-capacity fuel tank that’s designed to give the rider an unrestricted riding position. And since it’s priced right, you can start your adventure today. STEP SEAT: The CB500X’s 32-inch seat height and unrestricted riding position offer freedom of movement for usage in both touring and commuting. You’ll find that it’s perfect for around-town riding and also offers plenty of room for a passenger. 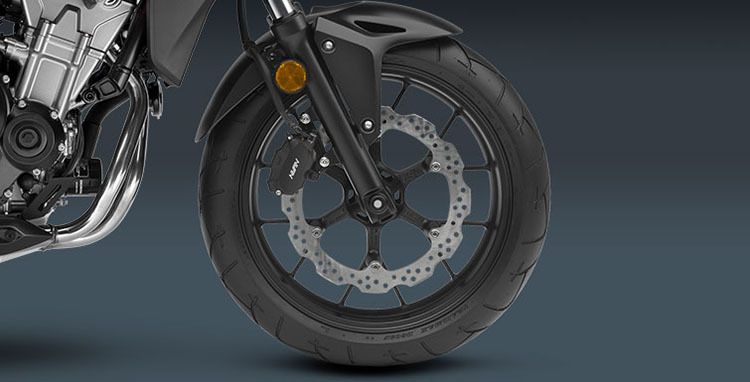 PRO-LINK® REAR SUSPENSION: A sophisticated chassis with Honda Pro-Link® rear suspension, with 9-stage preload and 4.7 inches of travel gives you a comfortable ride over small bumps, while capably absorbing bigger bumps to increase riding comfort and handling. 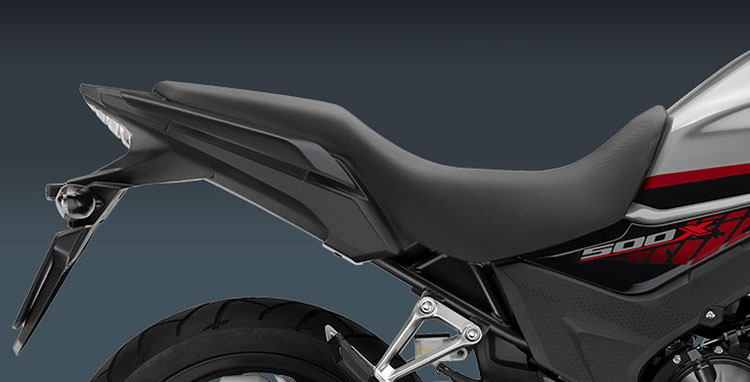 STEEL-TUBE FRAME: A motorcycle’s frame is the basis for its handling. A take on a classic construction, the CB500X’s diamond-shaped steel-tube mainframe ties to the engine with four mounts, offering a rock-solid foundation for superior ride and handling. 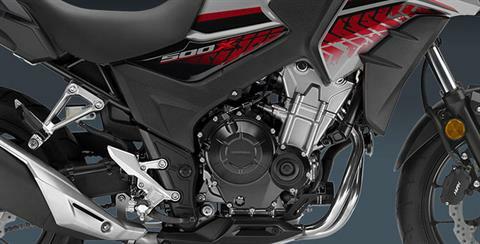 DOHC TWIN CYLINDER ENGINE: Honda twins are famous for their versatility, and the CB500X engine is one of our best ever. Using the same piston bore size as our CBR600RR sportbike, the parallel-twin engine offers accessible performance across all RPM ranges. PROGRAMMED FUEL-INJECTION (PGM-FI): Programmed Fuel Injection (PGM-FI) continuously monitors several variables to ensure the correct fuel mixture is delivered for the existing riding and atmospheric conditions for crisp throttle response throughout a wide variety of riding conditions. UNIQUE STYLE: Adventure doesn’t have to mean bottomless mud pits a continent away. Like your favorite blue jeans, the CB500X just looks right—tough, capable, no-nonsense. 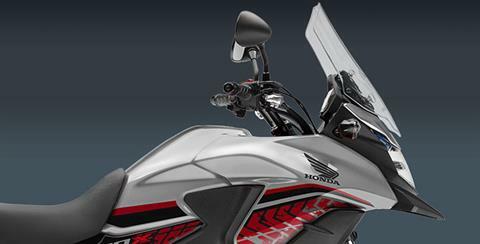 Plus, the adventure-bike posture and seating position let you move around freely—just like your jeans! DIGITAL INSTRUMENTATION: An amber-tinted full LCD screen features digital speedometer and tachometer and more, including a clock, odometer, trip meter, real-time and average fuel consumption meters and illuminated engine diagnostic indicators. ADJUSTABLE WINDSCREEN: The CB500X’s windscreen offers superior wind protection, and is adjustable so you can fine-tune your cockpit environment. LED HEADLIGHT: With a clean, rough-and-ready look, the CB500X’s LED headlight and multi-facet reflector project plenty of light on the road for visibility. LONG-TRAVEL FRONT SUSPENSION: The long stroke 41 mm front fork yields a full 5.5 inches of travel, and a wide handlebar allows for easy steering inputs. DISC BRAKES: The front 320 mm wave-style disc brake and 240 mm rear provides strong stopping power. 12-SPOKE CAST WHEELS: Strong and stylish, the CB500X’s lightweight 12-spoke cast-aluminum wheels—120/70-17 in front and 160/60-17 rear—are easy to keep clean, look great, enhance handling and are another CB500X feature that just makes sense.